The Varsity One 711 Super Tough Treadmill is built for heavy use by high school students and adults. The 3.0 horsepower motor combined with steel reinforced running frame accommodates users up to 300lbs. The Varsity One 711 Super Tough Treadmill comes with computer programs to help motivate users to be active and fit. Safety side handrails and a detailed computer readout are standard. College students, especially online college students, have packed schedules. Classes, employment, and family or social obligations quickly fill up your calendar. It seems cruel to add another obligation to the list, but here’s one to consider: exercise. Scientific evidence is piling up that shows regular exercise provides important cognitive benefits that could make your scholarly efforts a little less taxing. Recent human and animal studies show that regular aerobic exercise has profound effects on the brain. A recent New York Times article, “How Exercise Could Lead To A Better Brain” , describes experiments performed on mice at the University of Illinois. Mice who ran regularly on a wheel had more neurons—brain cells—than those who did not. Also, mice who ran regularly had more complex connections between neurons, meaning they were able to access their brain cells more flexibly. Finally, the mice who ran regularly did better on cognitive tests, such as completing a maze. There's evidence that this direct relationship also exists in humans. The hippocampus is a structure in the brain that controls the formation, retention, and recall of memories. In most adults, the hippocampus starts to shrink slightly starting in the late 20s, leading to memory loss over time. Evidence from a 2011 study, recounted in the New York Times article mentioned above, shows that exercise prevents this shrinkage and may even promote regrowth. A group of senior citizens were randomly assigned to a stretching program or a walking program for a year. After the year was over, the stretching group’s brains were scanned, and their hippocampuses had shrunken according to normal expectations. In the walking group, however, the hippocampus had grown. For college students, the implication is clear: regular exercise could benefit the parts of your brain that help you recall information. In 2009, a Canadian school for learning-disabled and ADHD children took part in an experiment that involved having students exercise for 20 minutes on treadmills or exercise bikes before starting their math class. Teachers noted a marked improvement in students’ ability to concentrate, participate, and retain information during the class after they had exercised. Inappropriate behavior also improved in the group that exercised. Additional experiments of this type, such as those taking place at Naperville Central High near Chicago, IL, suggest that three 20-minute sessions a week is the minimum dose needed to reap the concentration-enhancing benefits of exercise. Numerous studies have shown that exercise profoundly improves your mood. A 1999 Duke study into the effects of exercise on depression had some participants work out while others took a well-known anti-depressant medication. By the end of the study, the exercise group showed as much improvement in mood as the medication group did. So college students looking to maintain their positive attitude to succeed can benefit from regular exercise. Prolonged stress can lead to health problems, such as heart attacks and stomach problems. Exercise, by helping you sleep better and easing anxiety, can relieve the negative effects of stress on your body. Many regular exercisers also find that they can focus constructively on problems during or after a bout of exercise. So make time for exercise. Choose an activity you love that gets your heart rate up, whether it’s hiking, running, or dancing, and put it on your schedule the way you would any other appointment or class for at least three 30-minute sessions a week. You’ll soon be reaping the benefits that exercise offers the scholar: a sound mind in a healthy body. Call 1-800-875-9145 to speak with one of our fitness advisors with any questions you may have. How do we put a price on our kids overall wellnes and their future - Go to FitnessZone.com today to order the Varsity One 711 Super Tough Treadmill and let's give our kids the advantage they deserve. 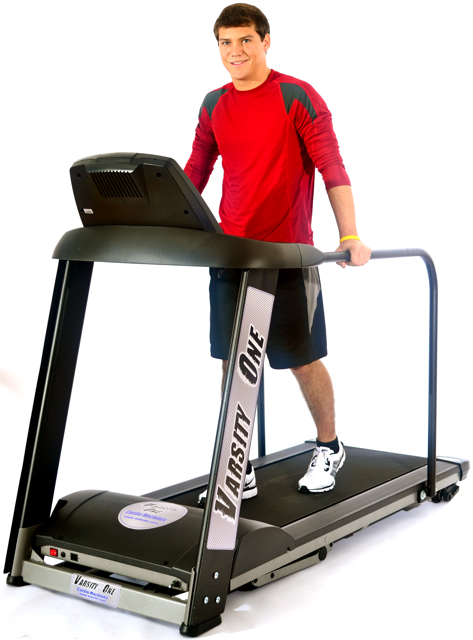 Order your Varsity One 711 Super Tough Treadmill from FitnessZone.com today!